Global warming leads to increased endosymbiotic archaeal growth and endogenous digoxin synthesis by new cellular organelle called the archaeaon steroidelle. Right hemispheric dominance and kapha state of the tridosha theory is due to hyperdigoxinemia and increased endosymbiotic archaeal density. Left hemispheric dominance or the pitta state is due to hypodigoxinemia and decreased endosymbiotic archaeal density. The intermediate bi-hemispheric dominance or the vata state represents normodigoxinemic state and normal endosymbiotic archaeal density. 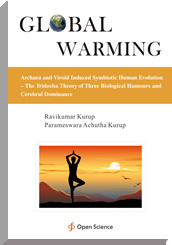 Thus the tridosha theory and hemispheric dominance are based on symbiotic evolution.